Shearwater turned out en masse… even managing a new entry in the last week! Genesis dropped by the wayside much like the poor neglected Bonsai… we hope the newly purchased replacement (thanks Maersk!) will not suffer the same fate in its new home at Shell. Registration for Wednesday is in the Southern car parking area. Turn right at the mini roundabout near the first parking area and carry on until the road runs out! Hopefully we will get the BBQ cranked up so bring some food along. If you have some BBQ tools these will come in handy too. Courses are: Easy – 1.6km, medium 2.5km, short tech 3km and long tech 4.1km. Please pack a waterproof, it can be quite cold on top of the dunes if the wind and rain gods are working overtime #itmaybetheendofJunebutthisisScotland. John has shunned his responsibilities as spreadsheet master again this week by remaining stuck offshore…some people will do anything to avoid typing in a few numbers. Anyway in his absence Shearwater have shot into the lead (and managed to get 9 people out last night- good effort!). Victoria and Claire still leading the ladies and Gareth and Jamie leading the men. Perseverance prize this week goes to John D. and Alan of Shearwater…..25 mins on point number 3…. Next week is the last GAC (but not the last Summer Series so if you’re hooked, please keep coming!) at Balmedie. BBQ after your run – you finally get to meet your team and your rivals other than in a bog or a thicket. Bring some meat to cook, BBQs and coal all provided. NB Car park at Balmedie is not the main one – turn right at the mini roundabout just before the main car park and drive along the road heading south for about 0.5 km. Gramp flag should be flying. It seems that Shearwater don’t do rain, only John turned up! Maersk and Genesis at least managed 4 people each. Full marks to Katrine and Sue of Genesis for perseverance! Many thanks to Jonathan for feeding the Lang family emergency Boost bars whilst we waited for their return. Genesis were short of men again this week and surprisingly so were Maersk. Shell/Shearwater were short of ladies…Maybe they should do a deal? Some great performances for many on what was a distinctly harder course than Hazlehead or Countesswells. Overall Maersk and Shearwater are neck a neck…all to play for….and you never know Genesis may yet get its act together…. Tyrebagger next week – bigger paths than Scolty and some nice big man made objects to relocate on but still plenty of opportunity to get lost in the woods. Shell Shearwater are this year’s well deserved champions. Congratulations! Top 3 women’s and top 3 men’s scores make up the score for the night. The series result is based on the team’s best 4 events. Individual totals are also based on your best 4 scores. Maersk successfully defended their winners trophy in 2015. Well done everyone for tackling some tough courses! Points are awarded depending on finish position to the 1st three females and males in your team and the best 4 team results out of the 6 will count towards your team total. Trophies for first 3 teams and first 3 individuals from the series. At last the sun was shining on a Wednesday evening! Some highlights and apologies from Balmedie! – Apologies to those who turned away when they saw all the cars. The beavers, cubs and their parents had turned up for a beach party, but fortunately did not want the BBQ! – Opening the padlocked BBQ so we didn’t have to wait for dinner, though thanks to Helen who tracked down the number to the lock. – Apologies to all on the Easy and Medium courses who were confused by some wrong control numbers; but well done for working out the controller had got it wrong and not yourselves. – The teams in the Grampian Adventure Challenge who were completing the final in the series. – Apologies to the runner who thought he was doing a Short Tech only to discover at the finish he had run a Long Tech! Well done to all the runners in the three teams who entered the first Grampian Adventure challenge. The winning team were Maersk with Genesis second closely followed by Fugro. For their performance Maersk take home the Grampian Bonsai as a reminder of all those forests they have been running through over the past few weeks. Look after it! The winning male and female were both members of Gramp (they knew what they were doing!) and the first non-orienteers were Craig Burry and Claire Anderson. Over the series we had a total of 27 competitors who ran 98 times. Conditions were mixed with the mist of Balmedie during the training event, the rain, damp and quarry of Foggieton and the nettles of Dunottar. For the last two events at Crathes and Balmedie summer finally arrived. 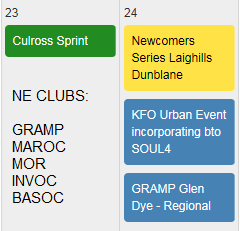 If you want to continue your orienteering you are welcome to come along to all the events which run every Wednesday through the summer, continue in the Autumn with the urban series and if that’s not enough the night series over the winter. We hope to see you in the woods! NB Next Wednesday (July 2nd) it’s Kingshill. We have been told not to use the Rotten O’ Gairn car park so we will have to park in the Countesswells carpark instead. This will mean a 15 minute walk to the start, but the quality of the fabulous orienteering at Kingshill will compensate for this! Genesis team pictured here but sadly we didn’t manage to catch the others – did you? Send us your photos if you have any please. Email GAC@grampoc.com if you want to contact us.